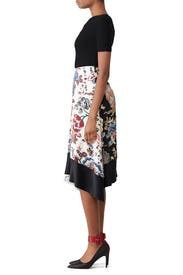 This lively floral-print skirt by Tory Burch has so many styling options to offer you. 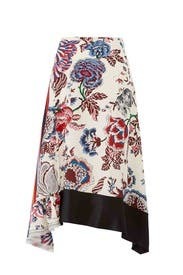 White multicolored printed silk (100% Silk). Skirt. Invisible back zipper with hook and eye closure. 29" from waist to hemline. Imported. Absolutely stunning! Compliments all around. Love, love this elegant skirt!! Loved the flow and pattern. Light weight. Fit great. Beautiful, but didn't wear it. Absolutely gorgeous, but it runs small! 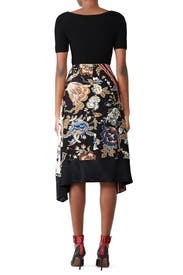 Beautiful skirt, very unique, high quality fabric. I only wore this once but The prints are so pretty I liked having it around. Had a little problem with static cling. This skirt was just so, so pretty on. I wore it with a marled blue cropped off-the-shoulder sweater and navy suede strappy sandals. Very stylish. Would loved to have purchased! Silk is heavy, drapes beautifully and flows when you walk. Multi-colored floral pattern is bold, but not over-powering and can be paired with many different colored tops. Small strip of shirring at hem provides a touch of whimsy. Size up - I normally wear a 2 and the 4 fit perfectly just below my natural waist. Would liked to have kept if weren't so expensive. Very feminine and good quality. Could have gone down a size but for most part it is true to size. I liked this skirt, but might've loved it had I gone with a size 4 instead of 6. The waist sat on the top of my hips instead of my waist, so it probably wasn't as flattering as it could've been. I wore the skirt with a cozy black sweater to the theater. Very comfortable, many compliments, and is fun for every day wear. Felt like a goddess in this silky dream of a skirt! This flowy dream of a multi-patterned print silk midi skirt was my favorite item of my RTR Update this month! Fully lined, skims off the hips and flows like a dream when walking. 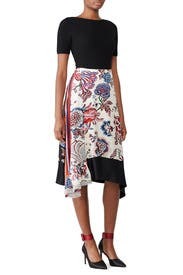 The slightly asymmetrical hem adds interest. It does run large in the waist, but I belted it and it was fine. I loved the various patterns and hems, definitely one of a kind garment. A lot of options available with regard to a top to pair with as there are so many colors in the print. Definitely would have purchased if wasn't so incredibly expensive. I rented this for work and received so many compliments. I'm usually a 4 and sized up to a 6 and it seemed a bit tight in the waist but I have a boxy torso. Could easily wear this on the weekend with a tee and denim jacket. This skirt is gorgeous- the pattern is all over the place but comes together beautifully. The skirt is silk and can wrinkle but it isn't very noticeable. It's also lined. It's a little tight in the stomach for me but I just pulled the skirt a little higher to make it comfortable. I wore this primarily to spice up my work wardrobe and received many compliments. It flows beautifully and the design/colors are so fun and unique. Super cute and fashionable! How does a designer get this many patterns to look so great together? I love this skirt. I ordered a size 6, but I think that a 4 may have fit better. I have an athletic, gymnast body. I do not have a tiny waist so I'm thinking that this runs a bit large. It still looked great! Incredible skirt - material and print is amazing. Great skirt to dress up or down. Beautiful material - tons of compliments. Would definitely rent again. Beautiful, flowy skirt. Very unique pattern - had a lot of fun wearing it. This skirt runs just a tad small. I usually wear a 6 - and that is what I wore in this skirt - but, if I rented it again, I would go up to an 8. I wore this to work with a black blouse, but could also work for a night out with a fancier top. 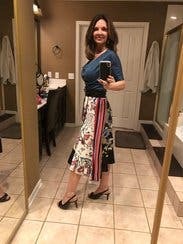 Love this skirt, colors go with many things I have. Fit is good. 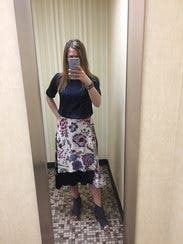 I wore this skirt to work then went straight to holiday parties that evening and got so many compliments all day! It fit me perfectly, and as a girl with curvy hips I appreciated that it made my waist look small. Such beautiful fabric, I felt so elegant all day. 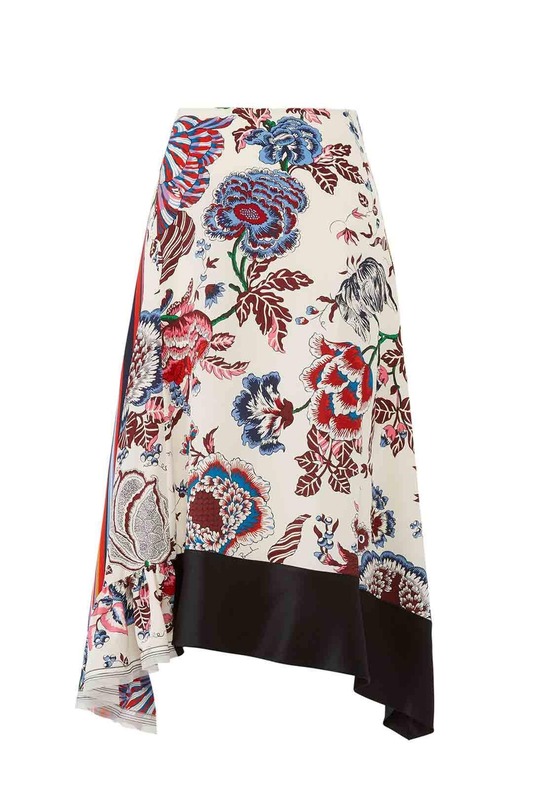 high-quality silk skirt. The look and feel of this skirt are LUXE. It fit well and i felt like a million bucks! Great fit. Love that it can be worn with navy or black. Nice length. Only downside is no pockets. I wore this to work with a black sweater and heels. This skirt is gorgeous and fun. I am between a 6-8, and the 8 fit perfectly in the waist, I doubt I could have zipped up the 6. Will be wearing this one again, for sure! This hangs well, is interesting without being silly or ridiculous looking, and is generally lush and lovely. It is also a nice length for my 5'10" frame.